In this episode of the Random City Podcast, I discuss a few of my favorite Halloween Specials and favorite Halloween themed episodes. 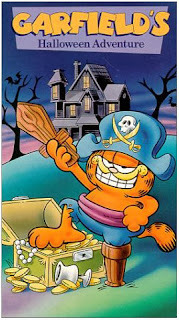 Discussion includes Garfield in Disguise from 1985, which was later renamed Garfield's Halloween Adventure (pictured on the left). We also take a look back at The Fresh Prince of Bel-Air season one episode "Someday Your Prince Will Be in Effect." The Seavers are discussed from the Growing Pains season six episodes "Happy Halloween Part 1 and 2." I also reminisce about Quantum Leap's The Boogieman episode from season three, and the Boy Meets World season five episode "And Then There Was Shaun." The opening credits from the Growing Pains Halloween episode.